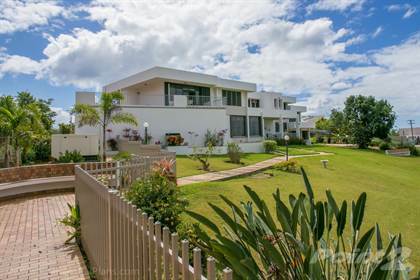 Beautifully designed mid century style home on one acre of land with ocean views. Located in the Miradero neighborhood of Mayaguez, close to the Mayaguez airport and Rincon, this architecturally unique home has over 6,000 square feet of living space. Offering 6 bedrooms and 5 bathrooms, large terraces, a huge kitchen and sunken living room on 3 lots totaling about one full acre. There is also a large carport, front yard fountain, outdoor covered patio and gazebo, lush landscaping and electronic gate. You will love the amazing sunsets and ocean views from the master balcony and large accordion doors in the family room leading to a beautiful patio. Click on the Virtual Tour link for floorplans and pinpoint photos. \r Qualified buyers, contact us today for a showing! Hi, I'd like to find out more information about Mid Century in Mayaguez Miradero. Thanks so much!